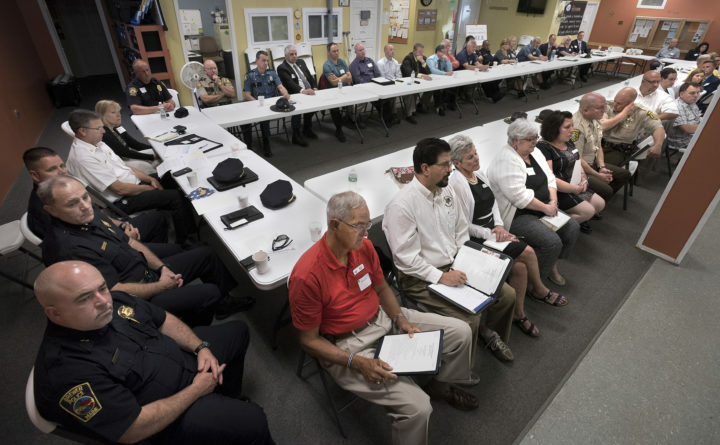 Rep. Bruce Poliquin hosted a forum in Brewer at the Bangor Area Recovery Network focused on combating the opioid epidemic in Maine, May 30, 2018. Maine is losing the battle against opioids. Other states aren’t exactly winning, but many are having success at reducing the epidemic’s death grip, while the death toll in Maine continues to rise. Maine was the sixth worst state in the nation in terms of increases in opioid deaths, according to new data from the Centers for Disease Control and Prevention. Three states in New England — Massachusetts, Vermont and Rhode Island — saw decreases in overdose-related deaths. Although New Hampshire and Connecticut’s death rates rose, the increases were significantly smaller than Maine’s. According to the CDC, overdose deaths in Maine increased 10.9 percent between January 2017 and 2018, compared with the national average of 6.6 percent. The CDC says 407 people died from drug overdoses in Maine during that time, up from 367 deaths in 2016. The CDC numbers are slightly below the Maine attorney general’s office, which reported 418 deaths in 2017 and 376 deaths in 2016. It is not a big mystery why Maine is failing. For one, it is the only state in New England that has not expanded Medicaid, as allowed under the Affordable Care Act. Lawmakers tried for years to pass an expansion, but Gov. Paul LePage vetoed it five times. Voters last year approved expansion, but LePage refuses the implement the law that would extend to health insurance to about 70,000 low-income Mainers. Medicaid is the largest funding source for behavioral health treatment, including for substance-use disorder. So, it naturally follows that in states that have expanded Medicaid — and received hundreds of millions of dollars in federal funds for health care — more residents who are seeking treatment for substance-use disorder can now access it. With health insurance, these people can now get medications like suboxone, which is used to treat substance-use disorder, and Narcan, a brand name for the overdose-reversing medication naloxone. In addition, opioid-related hospitalizations for individuals without insurance dropped substantially in states that had expanded Medicaid, according to an analysis by the Center for Budget and Policy Priorities. “A serious approach to combating the opioid epidemic must include coverage of medical treatments for individuals that suffer from [opioid use disorder]. Expansion of Medicaid would be the single most effective tool in this endeavor,” Andrew Huhn, an instructor at the Johns Hopkins University Department of Psychiatry and Behavioral Sciences, wrote in a recent journal article. A major reason Maine is failing is that it has not followed a consistent, comprehensive plan. Many groups have held roundtables and developed plans to address the crisis. Some important steps have been taken, but they are not adequately funded or supported. The state has a blueprint in the Recommendations of the Maine Opiate Collaborative, which were released in May 2016. The collaborative was created by Gov. Paul LePage and headed by Public Safety Commissioner John Morris, Attorney General Janet Mills and then-U.S. Attorney Thomas Delahanty. Some of its recommendations were broad and long term, such as larger investments in young children, changing the culture around chronic pain treatment and addressing the root causes of substance use such as poverty and hopelessness. Others were specific, such as expanded access to Narcan. This straightforward recommendation highlights the difficulty of enacting and following common-sense steps to address opioid use. Lawmakers passed a law to make Narcan available without a prescription and directed the Maine Board of Pharmacy to write the needed rules, which is finalized last August. The rules languished on Gov. Paul LePage’s desk for months as he argued that the law should be changed to make Narcan available only to those 21 and older. The Board of Pharmacy gave in to LePage and raised the age requirement. Lawmakers then passed another law to remove the age limit. It was vetoed by LePage, but the veto was overridden. While this nonsense was going on, dozens of Mainers died from opioid-related overdoses. Rather than wasting more time, and lives, Maine’s next governor and Legislature must truly make easing the opioid epidemic a priority, with sustained focus on policies and practices that work.